Agreements under which the Pistons will move to downtown Detroit and begin playing next season at the new Little Caesars Arena in The District Detroit, a $1.2 billion sports and entertainment development, have been announced today. The move to Little Caesars Arena, which is expected to open next September, will include construction of a new Pistons practice facility and corporate headquarters, and a community benefits plan that officials say will bring millions of dollars into Detroit neighborhoods. Relocating the Pistons and building a new practice facility and corporate offices will generate an additional $596.2 million in estimated total economic impact in metro Detroit and create more than 2,100 jobs, according to a study by the University of Michigan Center for Sport and Policy commissioned by Palace Sports and Entertainment. That includes an estimated 1,722 construction and construction-related jobs, and 442 permanent positions. With the Pistons and Red Wings playing under one roof just blocks from the Tigers’ Comerica Park, and Ford Field, home to the Lions, Detroit will be the only North American city to have each of the four major professional sports leagues housed within four blocks in its urban core. Detroit Mayor Mike Duggan praised the move as further evidence of the city’s continued turnaround. The Pistons’ move is subject to approval by the NBA, and details are expected to be presented to the league’s board of governors sometime after the first of the year. Between now and then, formal legal agreements will need to be finalized, including an arena sub-concession and various other agreements between Palace Sports and Entertainment, the Ilitch organization, and the City of Detroit Downtown Development Authority. In the meantime, the parties have entered into various Memoranda of Understanding. 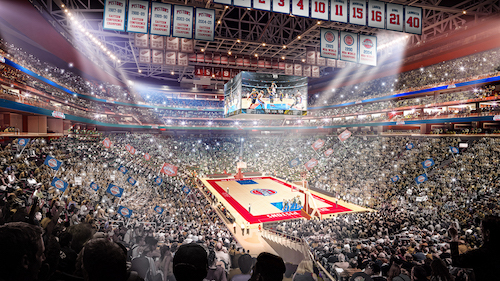 Under those Memoranda of Understanding, Palace Sports and Entertainment has agreed to bring the Pistons to the new Little Caesars Arena. The parties’ sports franchises will remain separate and each sports franchise will continue managing its own business operations. Ilitch Holdings, Inc. and Palace Sports and Entertainment have agreed to establish a joint venture in connection with their entertainment venues: Little Caesars Arena, Comerica Park, Fox Theatre, City Theatre, The Palace of Auburn Hills, DTE Energy Music Theatre, Meadow Brook Amphitheatre, and Freedom Hill Amphitheatre. 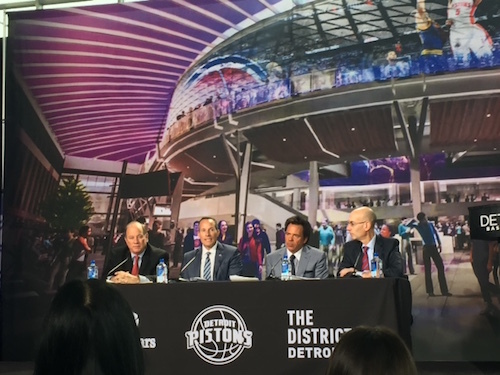 Detroit Mayor Mike Duggan; Chris ilitch, ceo and president of ilitch holdings; tom gores, owner of the detroit pistons; adam silver, commissioner of the nba, at a press conference for the Piston’s move to Detroit. The Detroit Downtown Development Authority (DDA) has agreed to contribute $34.5 million to cover the cost of modifying Little Caesars Arena to accommodate NBA basketball. The authority or taxpayers will not cover any cost overruns or additional expenses. It is estimated that at least 50 percent of the DDA’s contribution will come from savings generated through a refinancing of the existing Tax Increment Revenue bonds issued by the state in 2014 to partially fund Little Caesars Arena. Extending the term of these bonds by an additional three years will capture the remainder of the authority’s contribution. No general funds from the City of Detroit will be used as funds for the DDA comes from grants, contracts, and interest on loans. Following DDA approval of the agreement, the authority’s board, Detroit City Council, and Michigan Strategic Fund board will be asked to approve the amended tax increment plan to support the proposed refinancing. Duggan says if the Pistons build a practice facility and headquarters next to the arena, the team could tap funds from the Downtown Development Authority to help finance the project. The practice facility and headquarters would cost around $50 million. “We are looking at two different sites for the practice facility, one of which would be just north of the arena,” Gores says. The plan is to open the new complex in 2018. An architect has not been selected for the project. In turn, Gores says there was the potential for the Pistons to hold periodic practices at high school gyms in Detroit. “We want to be impactful in everything we do in Detroit,” he says. Adam Silver, commissioner of the NBA, says once the arena is open, the league would look favorably on hosting an All-Star Game there. An exact year has not been determined. “The new arena will be one of the best places in the world to watch a basketball game,” he says. The agreement with the city also includes a 10-point community benefits plan that will create jobs and bring millions of dollars of investment into Detroit neighborhoods. Under the plan, the Pistons organization agrees to invest $2.5 million over six years in the construction, renovation, and refurbishment of more than 60 parks in Detroit; employ at least 51 percent Detroit residents for the construction of its practice facility; award at least 30 percent of the value of all construction contracts for the practice facility to Detroit companies; use commercially reasonable efforts to maximize post-construction employment opportunities; and donate $100,000 to Detroit Employment Solutions Corp.
For youth in the community, the Pistons organization will partner with the Mayor’s Office to provide mentorship opportunities; participate in the Grow Detroit’s Young Talent summer jobs program; host free youth basketball camps, clinics, and other events to city residents; provide 20,000 free tickets per regular season to Detroit youth and residents to attend games. The organization will also appoint and maintain a liaison to meet, communicate, and engage regularly with the existing Little Caesars Arena Neighborhood Advisory Committee or, with respect to the practice facility, if necessary any other committee created by the city for purposes of engaging local residents. The Pistons are now playing their 29th and final season at The Palace of Auburn Hills and will honor that history throughout the season in a series of special event nights highlighting the players, championships, and special moments. Gores says it is premature to discuss the future of the Palace but expects there will be a lot of attractive options. According to a separate study done by the U-M Center, the move could benefit Auburn Hills, Oakland County, and the State of Michigan if the Palace is redeveloped. In that event, the study projects a net increase of $7.3 million per year in new property and personal income taxes and the creation of 1,950 construction and permanent jobs. Technology features of Little Caesars Arena will include WiFi capabilities, mobile ticketing, high-definition video, acoustic sound, smart phone mobile applications. The arena’s Via Concourse, an indoor street-style shopping and dining experience surrounding the facility, will be open to the community year-round, while the Piazza, an outdoor urban plaza, will offer to be programmed music and entertainment. The District Detroit is one of the largest sports and entertainment developments in the country. Located in the heart of Detroit, this 50-block, mixed-use development led by the Ilitch organization unites six theaters, five neighborhoods, and three professional sports venues. To learn more about The District Detroit read District Detroit Rising from DBusiness magazine’s May/June issue, and visit DistrictDetroit.com.